The Finsbury Park Mosque (FPM) is a community organisation working for serving the local community and becoming a platform for community engagement projects; raising public awareness and promoting mutual understanding, diversity and integration. The FPM has been successfully working in partnership with Islington Council, Islington Faith Forum (IFF), London Fire Brigades (LFB), Metropolitan Police, and Islington Safeguarding Children Board (ISCB) in addition to many other local and national organisations. As part of our commitment to promoting community cohesion and raising awareness we have organised open days over the past five years; events in which community members come to the mosque to see an exhibition, watch documentaries and have mosque tours. We have also organised a specifically designed open day for schools last year. The events were massively welcomed and achieved their goal. The Open Day for Schools was attended by around 250 students from various local schools. This year we are organising another two day Open Day event; the second of the two days is dedicated to school students. This year’s open day for schools will be on Monday 23 of June 2014 from 10:00 AM – 3:00 PM. 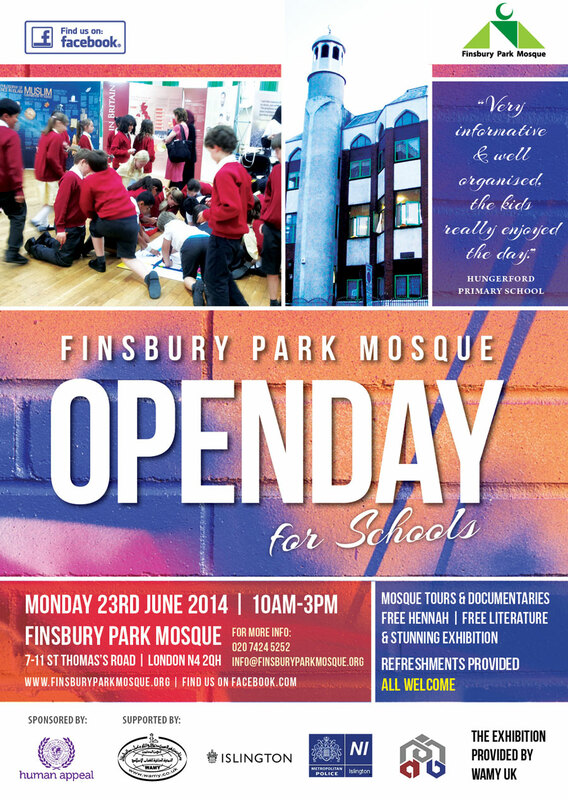 The school’s event will include, in addition to mosque tours, documentaries and stunning exhibition. Teachers and students will also be given opportunity to ask questions and know more about their Muslim neighbours, Muslim community and Islamic faith. This indeed will be a very good opportunity for the students as well as the school staff to remove misconceptions, get their questions answered and explore how other individuals live and practice their faith; it will definitely help in removing barriers and promoting diversity and understanding.